A few weeks back Kiwi and I went to our first American football match over here. 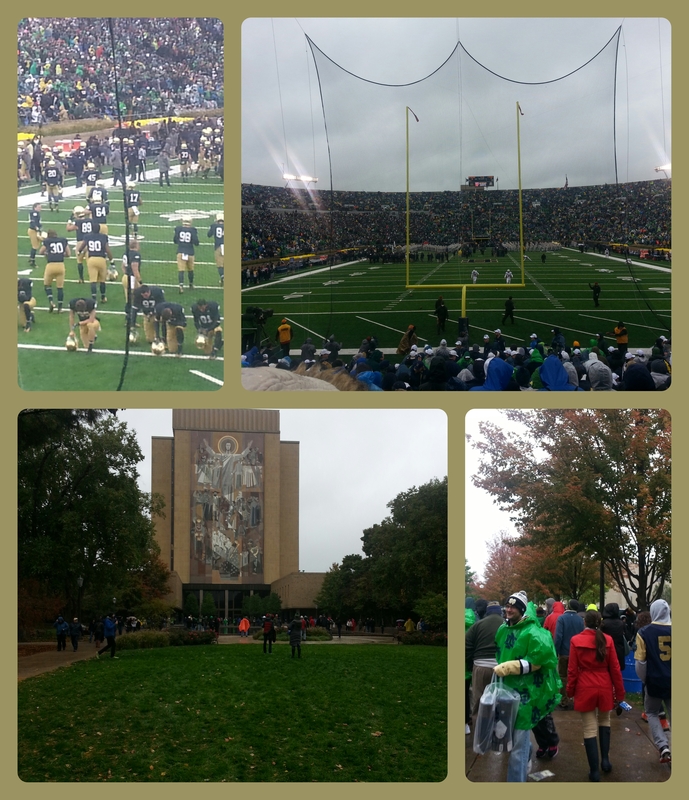 Our local team, the fighting Irish, play in Notre Dame stadium – a similar capacity to Wembley! Its huge, the seats are like wooden benches that you squish along on. Our first match was one of the coldest days we’d had so far! Having had weeks of pleasantly warm, and hot days, that remind you off lazy summer days, paddle boarding and going to the beach, a scheduled 4 degrees was a bit of a shock to the system! We wrapped up warm and walked down to the stadium. We were keen to check out ‘tail gating’ and what this entailed. Tailgating occurs before a match but must end by kick off. It appears to involve drinking lots of beer and having a bbq, often in the back of you car/trailer. Lots of people were bbqing and drinking beers, some people had driven down for the tailgating and would then watch the match in their trailer. I guess people need a beer coat, as there wasn’t any drinking once you were in the stadium. To say American football is a spectacle would be an understatement. The game is loud with music happening whenever there isn’t play. Cheerleaders line up along the side cheering and whipping up the crowd, most people dress up and wear home colours and visit ‘touchdown Jesus’. There is a full marching band – that fills up the whole pitch, and the crown generate a party spirit. The game itself was really stop start. We don’t really know the rules but worked out the basics as the games progress. Essentially each team gets 4 go’s to move the ball – mostly by throwing and catching – more than 10 yards. They keep doing this until they get a touchdown a penalty or lose the ball. Each ‘play’ seems pretty planned with little chance or spontaneity in the game. There are loads of players in each team, and for me the highlight was the Fighting Irishs’ impressive gold helmets and shoes. I’ve read about the experience of fandom and being in a stadium, but it really was something different. The fan culture was almost as exciting as the game, which was rather slow. Unfortunately it rained throughout most of the game, making it pretty miserable. I think the game lasted for maybe 5 hours, I kinda switched off once I couldn’t feel my feet. We did enjoy some fresh pretzels – lovely! and some ‘dipping cheese’ this was not cheese, it was cold orange gloop, and it tasted like gloop. We have another match coming up in a few weeks and might even try out some tailgating.